generality: you are in business whenever you can compute the score of your parametric conditional observation density with respect to the time varying parameter. These models have been applied successfully in areas such as default and credit risk modeling, stock volatility and correlation modeling, modeling time varying dependence structures, CDS spread modeling and questions relating to financial stability and systemic risk, modeling high frequency data, etc. Apr 8, 2019: Added new entries to the papers section. Apr 3, 2019: Added new entries to the papers section. Mar 27-29, 2019: Workshop on score-driven time series models, Cambridge (UK). Feb 26, 2019: Updated papers section with Harvey/Liao and Bisaglia/Grigoletto. Feb 21, 2019: Updated papers section with closed form dynamic copula paper of Opschoor et al. (2019). Feb 07, 2019: Updated some entries of Blazsek in the papers section. Dec 31, 2018: Updated Patton, Ziegel, Chen with computer code and added Vassallo et al. (2018) in the papers section. Dec 17, 2018: Added PhD thesis in the papers section. Nov 21, 2018: Added/revised four new/forthcoming papers in the papers section. Oct 15, 2018: Added/revised four new/forthcoming papers in the papers section. Sep 18, 2018: Added two new forthcoming papers in J.Econometrics and J.Time Series Analysis to the papers (earlier available as working papers here as well). Sep 3, 2018: Added further papers to the papers section as well as some corrections. June 12, 2018: Added a bunch of new papers to the papers section. May 01, 2018: Added further new papers and updates to the papers section. Apr 04, 2018: Added six new papers and updates to the papers section. Feb 28, 2018: Added the example code in the codes section for "Semiparametric score driven volatility models". Feb 19, 2018: Added the example code in the codes section for "Bank business models at zero interest rates": clustering with time varying means and covariances. Feb 5, 2018: Added new entries to the papers section: Chen; Buccheri; Lit et al. ; Hansen and Schmidthblaicher; and updated published and forthcoming entries. Feb 2, 2018: The main Generalized Autoregressive Score paper is in the TOP 10 of most downloaded published articles of all times of the Journal of Applied Econometrics. Really happy! See the Spring 2018 journal newsletter. 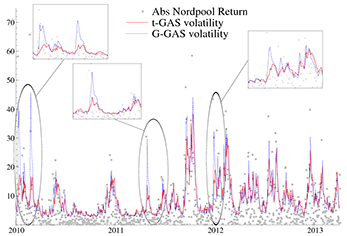 Send us your feedback or your contributions on GAS modeling at a.lucas@vu.nl. Before using any of the software, please read the legal disclaimer.